Rish clamp 1000A AC/DC is a highly innovative design for features those increases safety and comfort of user. * Rotating clamp jaws facilitate the measurement at physically awkward positions, vertical bus bars, conductors placed at positions difficult to access. * Location and design of trigger eliminates fatigues caused by single finger operation. It allows spreading the force required to open the jaws over more than one finger to ensure comfortable operation. * Comfortable operation of push buttons and function selector switch, in adverse field conditions. Narrow housing for firm grip and easy to carry. 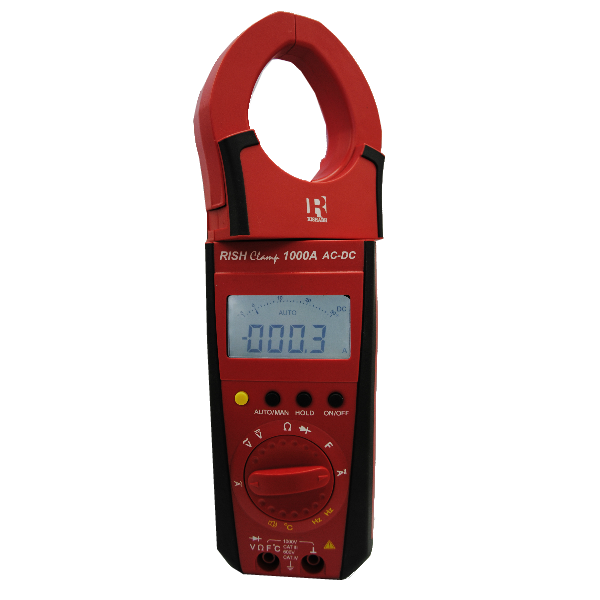 The clamp meter can measure accurately at not only the High currents but also Low current ranges. It is possible to conduct measurement using the clamp meter during night time in darkness with the help of Backlit. The back lit can be switched ON or OFF by pressing a single key. Temperatures from -200 to 800 °C using Pt 100 and Pt 1000 sensors. In order to save the power of the Batteries, the clamp meter will automatically shut OFF if it detects no activity for 10 minutes. Analog scale that updates at the rate 20 times/sec to observe fluctuations in input. In this mode, AUTO POWER OFF is disabled. By pressing DATA HOLD button, reading on the display can be latched for Hands free operation. In AUTO ranging mode the instrument automatically selects the range with best resolution depending on the applied input. In MANUAL ranging mode range is user selectable using MAN key. For testing diode and transistors, diode measurement function is available.